You are at:Home»Reviews»NomadPhone – Must Have Travel Facility ! NomadPhone is a communications app which is available for iOS devices through the App Store. While the app itself is free to download, it runs through a subscription service which is priced at $9.99 per month. It also includes a seven- or fourteen-day free trial, dependent on the subscription you choose. The app is designed for travelers and provides a reliable means for you to always be reachable by United States or Canadian phone numbers, wherever in the world you may be. It offers unlimited calls and texts to the US and Canada with the convenience of retaining one number, regardless of if you change your SIM. The app also allows you to organise your business using a number of lines and profiles which can be color-coded, making it even more accessible. How Did NomadPhone Work for Me? As a person who travels abroad for work at least once a month, NomadPhone is a brilliant app which has allowed me to stay in touch with my boss, clients and family from any country I have visited so far. In the past, I have had to purchase a new SIM every time I leave the US, meaning my phone number was constantly changing. Often, I would return home and find I had missed out on important information from my employer which was critical to the work I was doing, and I have even missed out on new job opportunities from clients who tried to reach me on my US number. Since I have had NomadPhone, this problem has been eliminated, and the fact I no longer miss work opportunities means the subscription practically pays for itself. What is the Difference Between the Subscription Services? The two subscription services are priced exactly the same, but differ slightly in the service offered to better suit the needs of different travelers. If you are more of a casual traveler who still needs to stay in touch for work or family, “The Traveler” subscription will be ideal for you. 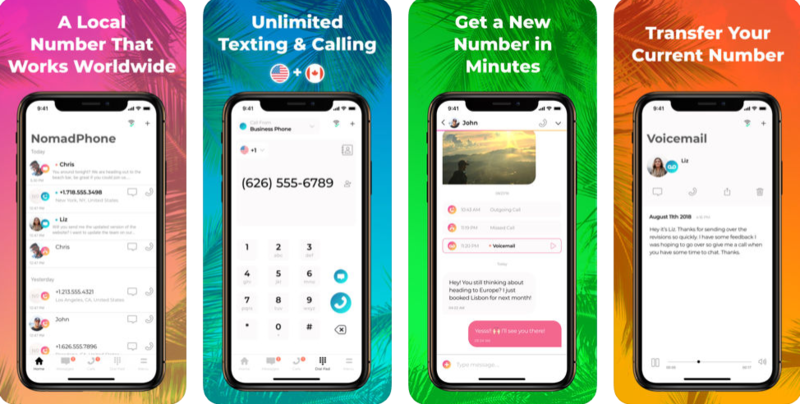 This subscription creates a new phone number for use while you are abroad, and allows you to forward calls from the existing number. You can also use an outgoing caller ID for either of these two numbers. “The Nomad” subscription is better suited to those who spend the majority of their time travelling outside the United States or Canada. This option allows you to port your existing phone number from your carrier to NomadPhone, meaning that you no longer need to have a wireless provider based in your country. There are not any other monthly fees included once you port your phone number, but there is a one-time charge of $12.99 to port your number into NomadPhone. Please note that NomadPhone does not offer a data connection, so you will either need to have a Wi-Fi connection or purchase a local SIM for data use. If you do end up without a connection while you travel, any communications will come through to you as soon as a connection is re-established, eliminating the problem of missed calls and messages while abroad. Previous ArticleU-nest iPhone app review.